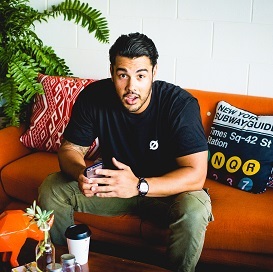 THE team at Business News Australia has compiled a list of the Gold Coast's brightest young business minds, highlighting the achievements of the city's most bold and innovative business founders. The next generation of leaders have demonstrated tenacity, contributed to economic prosperity and proudly call the Gold Coast home. Rounding out the top 40 are young founders that want to stand out from the pack. They have exhibited the potential for growth with exciting plans in the future. AFTER five years working at a private practice, Mike Luker decided to give opening his own podiatry clinic a crack. Ace Health Centre now counts professional athletes among its clients, while pushing the knowledge that podiatry can have a positive impact on overall health. "The way that everyone views podiatry is that they don't make an appointment unless something is wrong, rather than to further their sporting careers or injury prevention," Luker says. "A podiatrist studies for four years straight, so we know just as much if not more than the physio." Luker is in the process of finalising his own range of support in-soles, and plans to diversify into allied health with a full rehab centre. IN RECENT years, the Gold Coast has experienced a surge in creative industries including film and television, modelling, fashion and art. 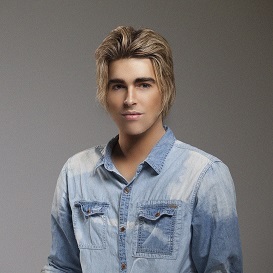 Michael Huxley has been at the forefront of that wave, creating courses through the Huxley School of Makeup that have quickly become an integral part of creative industry on the Gold Coast. Huxley, alongside his staff and students, can often be found on the sets of big-budget movies, major commercial projects, modelling campaigns, and fashion shows both nationally and overseas. "We work with Village Roadshow, and we are currently doing work with more fashion brands and magazines," says Huxley. "Certainly when it comes to professional makeup artistry services, our goal is to be the benchmark in makeup education." Huxley's portfolio of courses and work is expanding, as the Huxley School of Makeup student gallery has attracted almost 11,000 followers on Instagram to date. 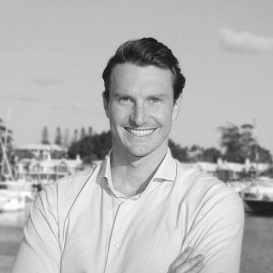 MG GROUP may only be a new player on the Gold Coast property scene, but founding director Matthew Grbcic has spearheaded the company to achieve a series of multi-million dollar contracts since its launch in 2014. The young project management guru entered the industry at 18 and worked for a few well established companies before deciding to test the waters on his own. Today he commands a portfolio of significant developments including a joint venture 100-home retirement village project, and 64-unit project in Brisbane worth $15 million. "It was a bit daunting when I first started out because the networks that I had were from my other companies," says Grbcic. "Still, I made a conscious effort to grow my own business with like-minded individuals, and I think that's how I really managed to generate interest and set myself apart in the industry." Grbcic is looking forward to the prospect of hiring another full-time project manager later in the year. MITCHELL Lambert and Jesse Willcox are taking on the big guns in real estate with their innovative marketing strategies. Lambert Willcox Estate Agents present each property from an interior design perspective, with chic photoshoots that even feature the family pets. Willcox says the use of video footage has also struck a chord with high-end sellers flocking to the boutique agency. "That's the biggest compliment you can get in real estate, our phones are ringing instead of calling people," Willcox says. "As far as marketing and branding are concerned, we've got an edge." He says Lambert Willcox Estate Agents has successfully pitched against larger agencies that have become 'complacent' in offering the 'care factor'. 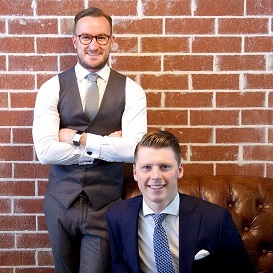 The dynamic duo has also opened a franchised office in Sydney to expand the brand. WHAT started as hobby documenting their culinary creations has become a way of life for Emma and Carla Papas, quitting their government jobs to launch the Merrymaker Sisters. The mindfulness movement sends fad diets, contradictory dietary information and negative body image on its merry way by promoting real food. 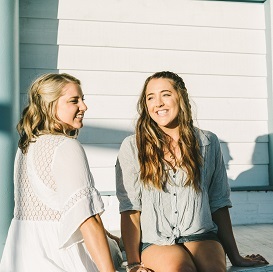 With two self-published books, seven meal plans, countless blogs and podcasts, the Merrymaker Sisters have built a strong following of women looking to nourish themselves and follow their dreams. "If you're putting out the real you and sharing from the heart, people will connect with that," Papas says. 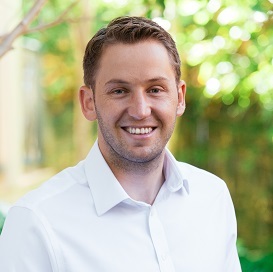 "We haven't looked back since starting our Merrymaker journey and feel truly lucky to have found a career path that makes us happy, gives us a sense of fulfilment and allows us to help hundreds of thousands of people." The Merrymaker Sisters will launch a merchandise store so customers can become ambassadors for the brand, as well as develop a wearable technology bracelet known as Chime. 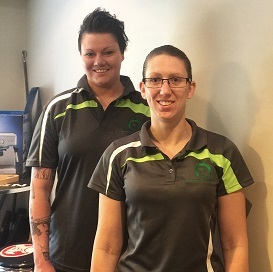 ASHLEY Hare and Danielle Storey, founders of Smarter Technology Solutions, have truly built a business for the future. The duo collects, analyses and applies big data from various sources, transforming it into knowledge designed to better the community. Also pioneering the fast-paced 'Internet of Things' industry, Hare and Storey have already formed ties with local governments to improve the safety and sustainability of cities. "We were able to help amend production schedules for waste management, optimising the collection and not having more trucks than necessary on the road," says Storey. "Assuming the pattern was implemented across the whole city, that potentially meant $2.25 million in savings for the government." Hare and Storey believe that councils, smart cities and healthcare professionals are the biggest groups set to benefit from the STS service. WEDDINGS are big business and Samantha Davies has a hand in sending couples towards holy matrimony. The romance-planner launched Unforgettable Proposals in 2013 to help people create the perfect setting to pop the question. Davies says the business will be restructured into a franchise model next year. "The biggest issue with Unforgettable Proposals is scalability and we obviously rely a lot on humans," Davies says. "It was very difficult to grow on the Gold Coast and Sydney while keeping margins high, because I was using a lot of contractors to perform the work. "I'm going to franchise Sydney and Melbourne and concentrate on Gold Coast and Brisbane, because we've had a big uplift here which has been promising." Unforgettable Proposals is building a partnership with diamond jewellers across Australia to promote its service, as well as advising a Listerine commercial in Thailand about proposing. LACHLAN Wortman says the Gold Coast can be Australia's answer to Silicon Valley and he wants to help make that happen. Wortman is an experienced traveller and studied politics and economics at University of London. It is through this global perspective that he sees the potential of so many businesses on the Gold Coast - not only in this city, but country-wide. "I made the effort to leave Los Angeles and Sydney and come back to the Gold Coast because here on the Coast we have that capacity to do international work with international firms and bring those clients from overseas, which will help the local economy," says Wortman. "We are still relatively small, but that is the purpose behind it and we have done projects that brought dollars into the Gold Coast market and that is something to hang my hat on." In addition to working with local and international clients at his management consultancy, Wortman is growing his own video promotion and construction materials companies. JENNIFER Stockwell embodies the 'have a go' mentality of the entrepreneur. She combines her love of sport and videography with a strong nose for new business opportunities. At first, Stockwell made videos of triathlon videos for free, with hired equipment, turning up at events despite the ambivalence of race organisers. Her passion and skill quickly earned her paid work and her own equipment and she now lives an enviable lifestyle, travelling the country making sports and tourism videos. "The online digital world is such an exciting place; so much can be created and there's so much talent out there waiting to be discovered," Stockwell says. There'll be no stopping Stockwell as she chases a dream of creating a sports-focused Australian television network of her own. WHILE cutting his teeth in hospitality marketing, Ty Kudla always wanted to open his own community coffee shop as a side project. When a space became available in his neighbourhood earlier this year, Kudla jumped on the opportunity and Randy Wallhole was born. The café in Southport has attracted a loyal local following with its uncomplicated menu of cereal cups, bagels, jaffles and eclectic branding courtesy of Kudla's role as account director at 40/40 Creative. "Through my work at the agency and work prior, I've been able to form relationships with suppliers and had a lot of great people around me to facilitate the launch," Kudla says. "Everyone treats everyone like family and people come back for that."